Step into my study! It’s small but, then, so am I… And it’s perfectly proportioned. To my left is a NZ-centric map of the world (perfect distraction) underscored by a choice selection of cards from friends full of stories and good feeling (perfect procrastination). I am finally, as of tomorrow, free of my old flat. 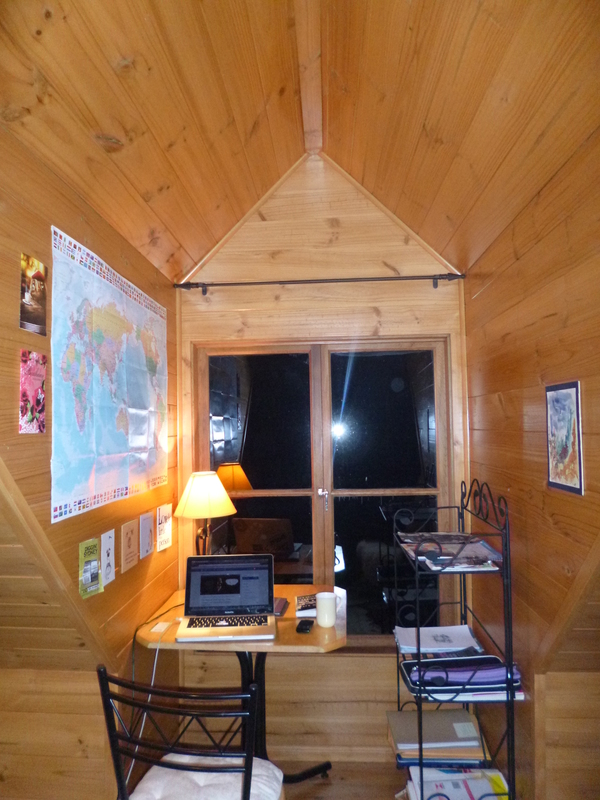 I mentioned before that I had moved to my dream pad – a fairytale cottage in the woods. The overlap has been pesky and the move has not been without some warfare. I hate packing. And I hate that in every place I’ve called home, it’s not been mine. I’ve rented but not owned. And so I’ve always had to justify myself in some way before, during or after my tenancy. In my previous flat, the estate agents claim that something is broken that wasn’t (to my knowledge) in any disrepair before I vacated the property. Further, the carpets (which I’ve had professionally cleaned) bear some wear. In vain have I pointed out that the carpets were not exactly squeaky clean or free of wear when I took the place on. Meanwhile, I’ve had to move a couple of old, disused television sets over to my new port of call, in the dark, in the torrential rain, because the local Salvation Army aren’t accepting second-hand televisions and, hence, I need to take them to the tip. Being 5 foot nothing (that’s 152cm to you metric folk!) and 8 stone (50kg), with the upper body strength of a small penguin, I need help to achieve this. And partner in crime is working away this week. I rolled the sets out of my car (with help from a friend) to the side of my drive (past my gate). At the top of my drive, admittedly by the road, lay an old rowing boat on a faulty trailer that we acquired to fix up and had to bring over from the ex-home. I couldn’t safely move this out the way without assistance (anyone who has seen me parallel park would back this up). Within 12 hours of television sets being left overnight on my own drive, I have had neighbours complain about them and a call from my new estate agents. They also mentioned the boat. And threw in an accusation of subletting because friends visiting us were spotted in my new home (looking too at home?! If so, I’m glad). It was also noted that we entered the garage that we weren’t supposed to. This was in order to desperately find some jump leads to start a vehicle that should have been on its way to work on a 4 hour journey already. Aaaahh but this is where I need to remind myself that there are two sides to every story. Hopefully, you’re on my side so far. The calls from the estate agents today put more nails in an already painful week of packing and moving and cleaning, which would already have been unmanageable without my friends. It’s difficult to take with equanimity a suggestion that you haven’t taken care of a place, when you’ve spent the last however long doing your best to do just that. And it’s equally difficult not to be hurt that your new neighbours choose to think the worst of you and tell tales, rather than ask the reason why a situation they have observed is the way it is. I mean, heaven forbid they could even offer assistance where it would be welcome! And yet, from the other point of view, I could be another in a long line of tenants who have taken liberties at someone else’s expense. I could be someone who’s broken into a new neighbourhood and started scuffing it up without a care in the world or any respect for my neighbours. Rather than stewing over the fact that I am not either of these people, I need to take on the lesson and learn not to judge. I clearly have no appetite for being judged myself! I need to appreciate the other side of the story in all of the stories that happen. Hopefully, this will also help me write a better story than the ones that are overly one-sided. How about you? Has anyone had a run-in with a real estate or landlord, but there was a reasonable explanation?! Is one-sidedness your foe, too? This entry was posted in On Searching For The Silver Linings, On Stories, On Where I've Come From & Where I'm Going and tagged editor, estate agents, make the right mark, moving house, packing, right ink on the wall, sara litchfield, two sides to every story, writer on October 22, 2013 by Sara Litchfield. This is one of the hardest things in life. Most people are so sure their perspective is truer or “righter.” I’d bake them cookies and introduce myself. LOL. Moving is hard.I feel your pain. I know the flat (apartment) we rented before we bought, we fixed up a lot, but no matter what you do, the landlord is looking for ways to NOT give your deposit back. Hope you get settled in and befriend the neighbors. Thanks Tam! That’s definitely a plan – though my baking skills may not do me any favours :p We definitely want to pop in on some people on the weekend when all the admin is over with the old place and have a friendly bbq or something! Ugh, my last place kept my deposit plus a $400 pet deposit and then charged another $175 on top– they claimed they had to replace the carpet? I cleaned that place for two days before I left– way cleaner than it ever was while I lived in it. I’m not gonna lie though– I’ve been a beastly tenant in my younger years. I once left 30 cinderblocks and green and red walls behind. College. Who knows. Agh that’s so painful! Lol I will admit our carpet saw some footfall, I didn’t cover everything in plastic sheeting and then hibernate in my room for a year with no visitors.. but the place was not exactly in a state of glory when I moved in and I haven’t thrown paint on the walls :p – if they charge us to replace the carpet, I will cry! And you KNOW they did not actually replace the carpet! Psh. Thieves, I tell you! Thankfully enough there is no neighbours out there whom cannot be won by an expert cocktail of empathy, helpfulness and appropriate use of cooking skills. It is, i believe, the nature of human beings to be weary of change. Even when the change is impersonated by genuine, smiley and respectful people. And even turn into friends when efforts are put in from both sides! And all this being foreseen and forthlooked, well, never mind the stained carpet! Hear hear my Lena 🙂 wise, poetic words as always!